Below is a listing of the various locations where The Face of Russia was filmed. To view more maps of Russia visit the following links. 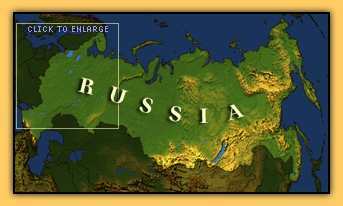 Contains a sensitive map of Russia and includes a list of further Russian web sites. Houses an extensive collection of Russian and former Soviet Republics maps. Listings of available maps from the CIA and how to order them. Offers maps, flags, facts and profiles for the countries of the world.